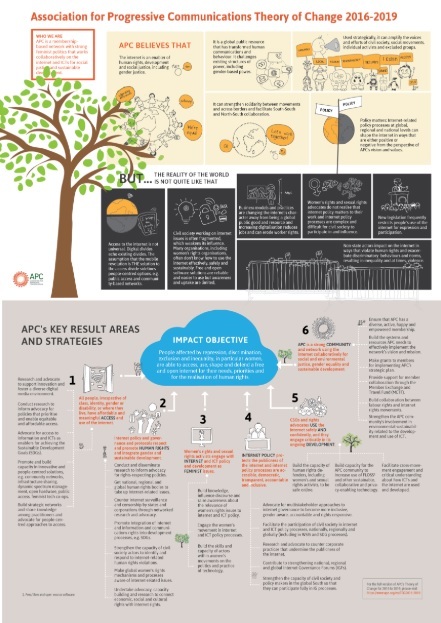 The Theory of Change identifies who APC is, our basic assumptions about the baseline context we work in, and the problems we address. It includes six key result areas (KRAs) which are strategic outcome areas or pre-conditions that we focus on as a means of making progress towards achieving our overall impact objective. For each KRA, we developed, with input from members, several strategies. APC's activities during the period are linked to these strategies. We do not have sufficient resources to invest equally in all strategies and will reflect this in the annual workplans we submit to Sida. 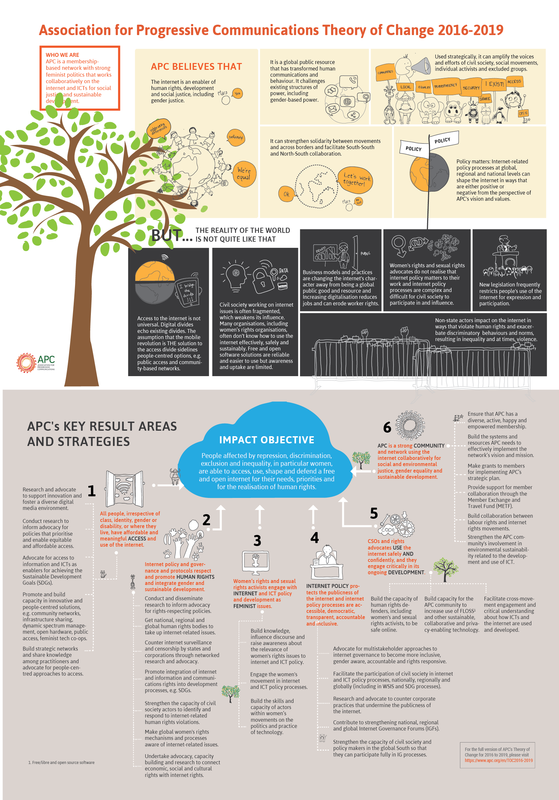 You can download the full version of APC's Theory of Change here [PDF] and the visual version here. APC is a membership-based network of organisations and activists who work collaboratively on the internet and ICTs for social justice and sustainable development, with strong feminist politics. The internet is an enabler of human rights, development and social justice, including gender justice. It is a global public resource that has transformed human communications and behaviour and that challenges existing structures of power, including gender-based power. If used strategically, the internet and other information and communications technologies (ICTs) can amplify the voices and efforts of civil society organisations, social movements, individual activists and excluded communities and groups. It can strengthen solidarity between movements and across borders and it facilitates South-South and North-South collaboration. The nature and outcomes of internet development and policy processes at global, regional and national levels can shape this global public resource in ways that are either positive or negative from the perspective of APC's vision and values. 1. Access to the internet is not universal. Access divides often reinforce existing divides based on geographic location, gender, income, and level of education. 2. Civil society movements working on internet issues are fragmented, which weakens their influence. 3. Business models and practices are changing the internet's character away from being a global public resource (or global public good). 4. Governments are introducing legislation that restricts people's use of the internet for expression and participation. 5. Civil society organisations, including women’s rights organisations, lack the awareness and skill needed to use the internet effectively, securely and sustainably. 6. Internet-related development and governance do not include gender equality and sexual rights perspectives. Women's rights and sexual rights advocates do not see internet policy and regulation as part of their agenda, which contributes to this lack of integration of their issues. 7. Non-state actors are impacting on the internet in ways that violate human rights and exacerbate discriminatory and fundamentalist behaviours and norms that result in inequality, oppression and at times, violence. 8. Increasing digitalisation means more jobs are temporary, which risks eroding the rights of workers, and the interconnectedness of the global economy directly pits workers in the developed world against workers in less developed countries who earn less. Many workers are tethered by the internet to their workplace for up to 24 hours a day. 9. Free and open software solutions are easier to use and more reliable but awareness and uptake by civil society organisations are limited. 10. Most policy makers assume that increases in mobile penetration has addressed the "access" gap. Few consider public access or community-based solutions as viable solutions. 11. Internet policy and governance processes are complex and difficult for civil society to participate in and influence; many in civil society are not aware of the importance of these processes to their work. People affected by repression, discrimination, exclusion and inequality, in particular women, are able to access, use, shape and defend a free and open internet for their needs, priorities and the realisation of human rights. People who are digitally excluded on the basis of where they live, gender, class, disability or identity, have affordable and sustainable connectivity that allows them to share and communicate. Women’s rights and sexual rights activists engage with internet and ICT policy and development as feminist issues. Internet-related and ICT policy processes protect the publicness of the internet and are accessible, democratic, transparent, accountable and inclusive. Civil society actors and rights advocates have the capacity to confidently use the internet and ICTs, and engage critically in their development. The APC community of members, allies and partners are strengthened as a network and work collaboratively to use the internet and ICTs for social and environmental justice, gender equality and sustainable development. 1.1 Research, advocacy and support for innovation to ensure diversity and plurality in the digital media environment. 1.2 Research to inform policy advocacy to enable equitable, affordable and sustainable access. 1.3 Advocate for access to information and ICTs as enablers for achieving the Sustainable Development Goals (SDGs). 1.4 Promote innovative and people-centred approaches (including in areas such as digital migration, community networks, infrastructure sharing, dynamic spectrum management, open hardware, public access, and access for women) through awareness raising and capacity building. 1.5 Build strategic alliances and facilitate networking and knowledge sharing among practitioners and advocates for people-centred approaches to access. 2.1 Conduct and disseminate rights-related research to inform policy and advocacy. 2.2 Engage with national, regional and global human rights mechanisms to take up internet and ICT rights-related issues (including economic, social and cultural rights). 2.3 Campaigning, research, advocacy and network building to counter internet surveillance and censorship by states and corporations. 2.4 Engage with SDG and other development processes to promote integration of internet, information and communications rights. 2.5 Strengthen capacity of civil society actors to identify and respond to internet-related human rights violations. 2.6 Engage global women's rights mechanisms and processes to integrate internet-related issues. 2.7 Advocacy, capacity building and further research to integrate economic, social and cultural rights into the internet rights agenda. 3.1 Build knowledge and influence discourse towards a feminist internet to raise awareness about the relevance of women's rights issues to internet and ICT policy. 3.2 Engage the women's movement in internet and ICT policy processes. 3.3 Build the skills and capacity of actors within women’s movements on the politics and practice of technology. 4.1 Engage critically and constructively with multistakeholder approaches to internet governance, making them more inclusive, accountable and rights and gender responsive. 4.2 Facilitate participation of civil society in internet and ICT policy processes, nationally, regionally and globally (including in WSIS and SDG processes). 4.3 Research and advocacy to counter corporate practices that undermine the publicness of the internet. 4.4 Contribute to strengthening national, regional and global Internet Governance Forums (IGFs). 4.5 Strengthen capacity of civil society and policy makers especially in the global South to influence internet governance processes. 5.1 Build capacity of women human rights defenders, sexual rights activists and other human rights defenders to be safe online. 5.2 Build capacity of APC community and partners to increase the use of FLOSS (free/libre and open source software) and sustainable, collaborative and privacy-enabling technology. 5.3 Facilitate cross-movement engagement and critical understanding about how ICTs and the internet are used and developed. 6.1 Ensure that APC has a diverse, engaged, active and empowered membership. 6.2 Strengthen the organisational capacity, systems and resources APC needs to effectively implement the network’s vision and mission. 6.3 Implement an APC grants programme that strengthens member contribution to the implementation of APC’s strategic plan. 6.4 Build collaboration between labour rights activists and internet rights activists in the APC community. 6.5 Strengthen the APC community's involvement in environmental sustainability related to ICT development and use.